Interest in digital accessibility law is growing. During May 2015, as we celebrate Global Accessibility Awareness Day, Lainey Feingold will be speaking four times about recent Department of Justice activities, court decisions, Structured Negotiations work, and other legal developments impacting digital accessibility. She will be presenting in Austin at the annual AccessU conference, during the online AccessU Summit, at the Global Accessibility Awareness Day Meetup in San Francisco, and as part of the National ADA Network’s technology webinar series. And at the end of April Lainey will be presenting about Structured Negotiations as an alternative dispute resolution method to lawyers in the Dallas County Collaborative Law Section of the Dallas County Bar. Read the details below and participate if you can. Lainey will be presenting at the John Slatin AccessU in Austin Texas on Monday May 11. This will be the fifth year she has spoken at this two day hands-on accessibility training conference sponsored by Knowbility, the accessibility consulting non-profit. Her session, titled What’s Law Got To Do With It: AccessU Digital Accessibility Legal Update, is being held on Monday at 10:15. The speaker line-up is impressive and Lainey is honored to be part of it. And this year Tommy Edison, the ‘Blind Film Critic’, is the keynote speaker. Should be great! On Tuesday May 12, Lainey will also be part of the online-only version of AccessU, called the AccessU Summit. The online conference, with presentations by John Foliot, Sharron Rush, Henny Swan and Susan Keohane, as well as Lainey, will be five hours of accessibility information delivered to your computer. No need to come to Austin (though the in-person version is not to be missed!). In both sessions we’ll go over the legal underpinnings of digital accessibility and usability, and the different ways the law can be used to advance the integration of people with disabilities into the digital world. There will be plenty of time for questions too. Follow #AccessU on Twitter to stay up-to-date about the conference and follow pearls of wisdom from all the speakers. This year Global Accessibility Awareness Day (GAAD) is on May 21. Lainey will be celebrating GAAD by speaking about digital accessibility legal issues at the Bay Area Accessibility and Inclusive Design Meetup, organized by accessibility evangelist Jennison Asuncion. The Meetup will be held in San Francisco from 6:00 – 8:00 pm at the Independent Living Resource Center. Read more details about the Global Accessibility Awareness Day Meetup. You have to RSVP if you are planning to attend. Global Accessibility Awareness day is the brainchild of Jennison and Los Angeles developer Joe Devon. You can read more about world-wide events designed to focus attention on the importance of access and usability in closing the digital divide for people with disabilities on the GAAD 2015 website. Also on May 21 Lainey will be doing a webinar for the ADA National Network as part of its Accessible Technology On-line Webinar Series. The session will be held from 1:00 – 2:30 Central and is titled “Digital and Technology Access: the Role of Law and the Limits of Law.” You can learn more and register for the webinar ADA National Network Online Learning page for Lainey’s session. The series is sponsored by the Great Lakes ADA Center, a member of the ADA National Network which is comprised of 10 regional centers funded by the National Institute on Disability and Rehabilitation Research (NIDRR), a division of the U.S. Department of Education. Collaborative Law is a well-accepted method of resolving divorce and family law cases outside of litigation. The alternative process was created in 1990 by a burnt-out divorce lawyer looking for a different way to use the law in the service of fractured families. Structured Negotiations is also a way to resolve claims without filing lawsuits, and I’ve always felt an affinity for family lawyers with a collaborative law practice. So I was excited last month when out of the blue I received a call from the Dallas County Bar Association’s Collaborative Law Section asking if I’d be willing to present via Skype during their April meeting. I was eager to say yes. Structured Negotiations developed at the intersection of blindness and technology. But I’m confident that the alternative dispute resolution method has application well beyond disability rights. I’m looking forward to exploring the possibilities of expanding Structured Negotiations to other practice areas with the lawyers in Dallas. 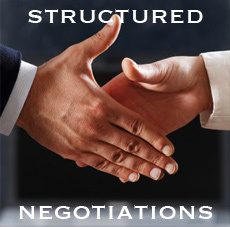 Read more about Structured Negotiations. Read more about Lainey’s presentation to the Dallas collaborative lawyers.